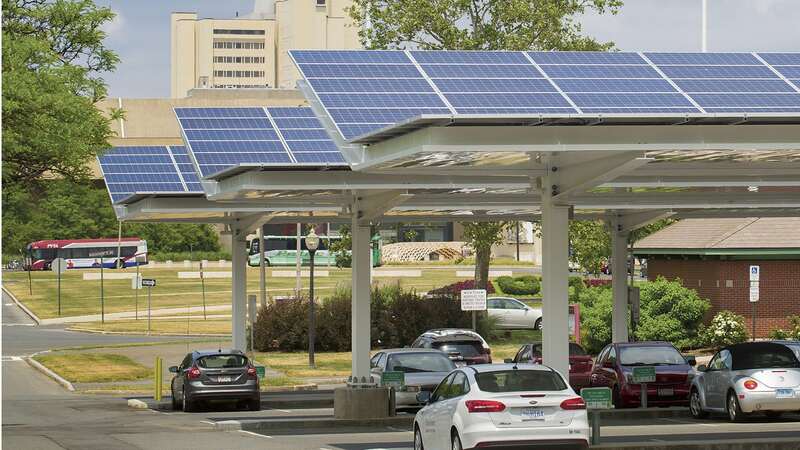 These solar canopies over a parking lot are part of a massive, campus-wide photovoltaic project. Because its region is so environmentally conscious, UMass Amherst would appear to be fertile ground for sustainable practices like green energy, eco-friendly buildings, and a buy-local ethos in food service. But it’s still remarkable how broadly — and effectively — the university has cast its net when it comes to sustainability. A national report placing the campus ninth in the nation for such efforts is the latest accolade, but UMass isn’t about to rest on its laurels. Call it a reward for a decade of work. When the Assoc. for the Advancement of Sustainability in Higher Education released the three-year results of its Sustainability Tracking, Assessment and Rating System (STARS), UMass Amherst earned placed ninth in the nation — a leap of 20 places from its previous rating in 2015. 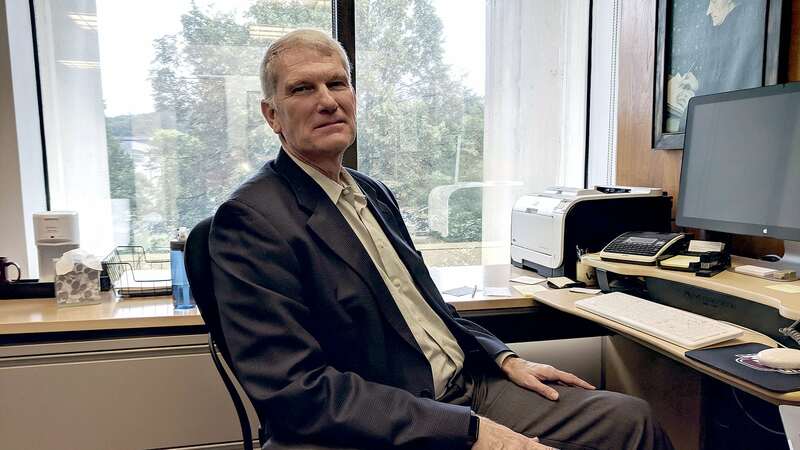 That’s gratifying, said Steve Goodwin, deputy chancellor and professor of Microbiology at UMass, who has been heavily involved in efforts to make the state’s flagship campus more green. And it’s not a recognition that was earned overnight. When Kumble Subbaswamy became chancellor in 2012, Goodwin said, he ramped up those efforts by forming an advisory committee specifically around sustainability, which helped to raise the awareness of green issues around campus. But before any of that could be accomplished — through innovative food-service changes, solar projects, green-building techniques, and a host of other initiatives (more on them later) — there had to be buy-in from both the university’s leaders and its students. Steve Goodwin says buy-in from students has been key to UMass Amherst’s sustainability successes. Take, for example, the Central Heating Plant, a project completed in 2009 that replaced the campus’ 80-year-old coal-burning plant with a co-generation facility that provides electricity for 70% of the campus and 100% of the steam needed for heating and cooling buildings across the sprawling grounds — all while reducing greenhouse gases by 27%. Those early years of UMass Amherst’s new sustainability focus also saw a reduction in water use — by using recycled water where appropriate — and partnering with Johnson Controls to incorporate energy-saving devices on much of the campus lighting. And that was just the beginning. “Since then, the sustainability committee has really taken the lead for the chancellor, and made it more of a campus-wide thing,” Goodwin said — in ways that continue to expand and raise the university’s green profile on the national stage. Early in the process, late last decade, UMass officials recognized food service as a prime area to boost efficiency and reduce waste. Not only did the sheer volume of food produced every day offer plenty of opportunity for improvement, but students were beginning to ask questions about waste. In 2014, UMass Amherst Dining Services was selected as a gold recipient for procurement practices in the 2014 Sustainability Awards given by the National Assoc. of College and University Food Services — just one way national experts were taking notice. Around the same time, the university’s sustainability staff and faculty team from Environmental Conservation, the Physical Plant, Dining Services, and University Relations won the state Department of Energy Resources’ Leading by Example Award. The UMass Crop and Animal Research and Education Farm in South Deerfield is home to the Student Farming Enterprise, which allows undergraduates to gain hands-on experience managing a small, organic farm. Produce generated there is sold to local stores and a community-supported agriculture share program. Building design has been another focus, a recent example being the John W. Olver Design Building, completed last year, which uses a wood-concrete composite flooring product that was developed on the UMass campus. The contemporary wood structure, which houses the Building and Construction Technology program, the Department of Architecture, and the Department of Landscape Architecture and Regional Planning, includes sustainability features such as LED lighting, motion sensors, ample natural light, electro-tinting glass, heat-recovery systems, bioswales, rain gardens, low-flow faucets, and public-transportation access. Meanwhile, the Integrated Science Building, constructed in 2009, employs cooling systems that reuse rainwater, state-of-the-art heat exchanges and ventilation systems, passive solar collection, and extensive use of eco-friendly materials like bamboo, to name just a few features. 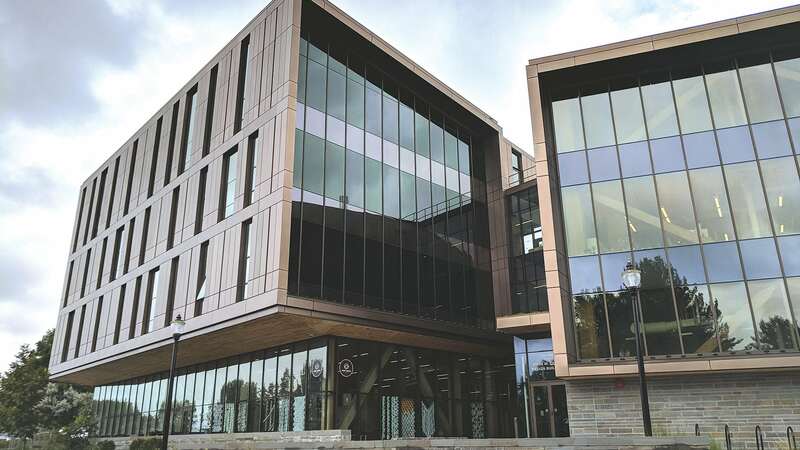 “Obviously building is a big chunk of where our resources go, especially energy and water resources, so building design has a big impact,” Goodwin said, noting that UMass typically aims for some level of LEED certification on new buildings. He stressed repeatedly, however, that raising up a culture of sustainability has never been a solely top-down effort, and that students have long been engaged on these issues. Students had a direct impact on one of the university’s most notable green decisions — to divest its endowment from direct holdings in fossil fuels in 2016, becoming the first major public university to do so. The John W. Olver Design Building is a model for green design and operation. A year earlier, the board of directors of the UMass Foundation voted to divest from direct holdings in coal companies in response to a petition from the UMass Fossil Fuel Divestment Campaign, a student group. Energized by that decision, the campaign staged a series of demonstrations to call for divestment from all fossil fuels, and the foundation board followed suit. It’s an example, Goodwin said, of the ways university leadership and the student body are often in alignment on issues of sustainability, both locally and globally. “So it’s been a balance of having sustainability in the curriculum, having demand from the students, and also having the central administration realize the importance of sustainability university-wide. Numerous people on campus are tasked with making sure UMass continually improves its efforts, including the creation of a new position, sustainability manager, seven years ago. 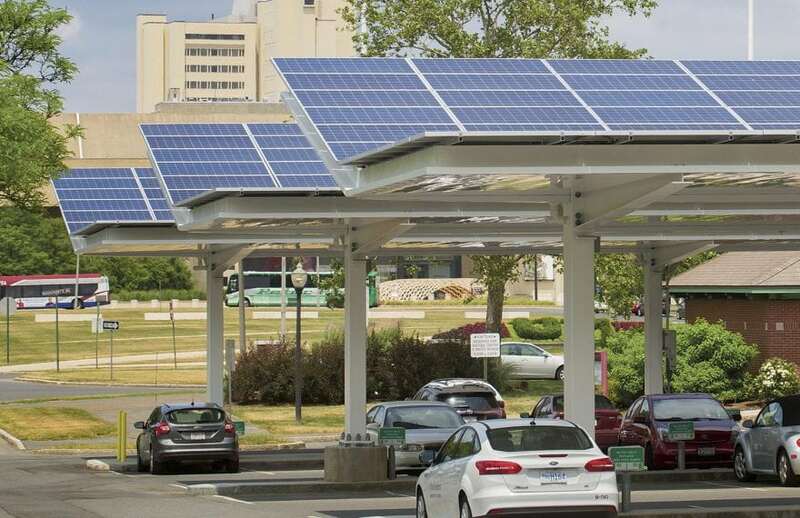 Last year, UMass Amherst made news on the green-energy front again, installing more than 15,000 photovoltaic panels across campus, providing 5.5 megawatts of clean electrical power for the campus to use for a heavily discounted rate. The initiative is expected to reduce greenhouse-gas emissions in the regional grid by the equivalent of 31,000 tons of carbon dioxide and cut the university’s electric bills by $6.2 million over 20 years. For now, he went on, the campus has a strong foundation in decreasing its carbon footprint and decreasing the amount of carbon dioxide and other greenhouse gases being emitted — efforts that have run the gamut from large-scale energy production to UMass Amherst’s participation in ValleyBike Share. Clearly, the impact of sustainable practices on not only the campus, but potentially the world, through the continued efforts of alumni, is reward enough for the university’s broad sustainability efforts — but the STARS recognition is nice too, Goodwin admitted, as it showcases UMass Amherst in the top 10 among some 600 participating institutions. The end result is certainly a source of pride on campus — and a little more motivation to continue and broaden these efforts. Not that UMass needed any.